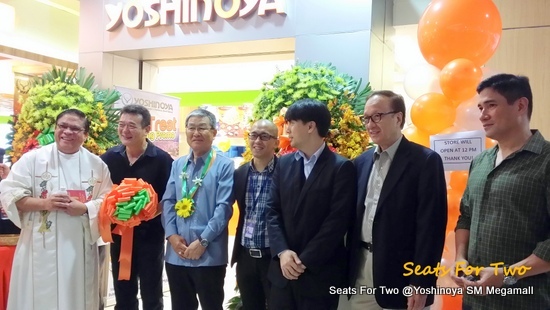 Husband and I attended the grand reopening of Yoshinoya, SM Megamall branch few weeks ago. We were delighted when we see the renovation – chic highlighting the orange-themed look and the brand’s logo, the “bull horn” which was invented by Yoshinoya’s Mizuho Matsuda in 1899.
with celebrity Ricardo Zepeda gracing the occasion. 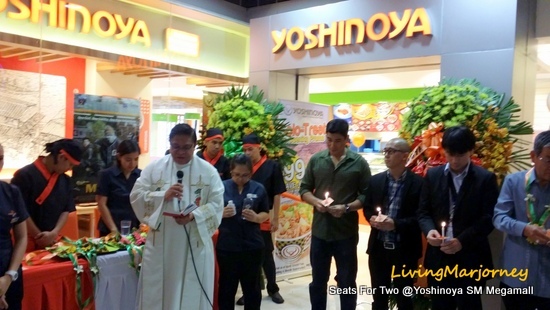 The event started with the traditional store blessing then everyone got to try Yoshinoya’s famous dishes. 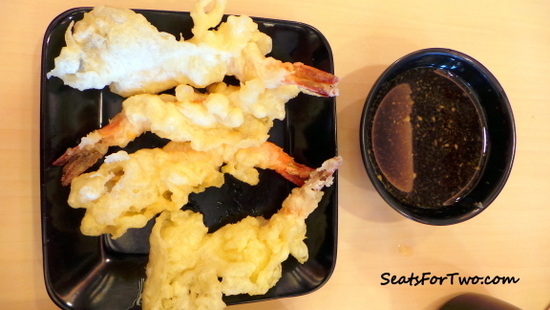 Seats For Two had Yoshinoya’s specialty, beef gyudon rice with vegetables and freshly-cooked tempura. 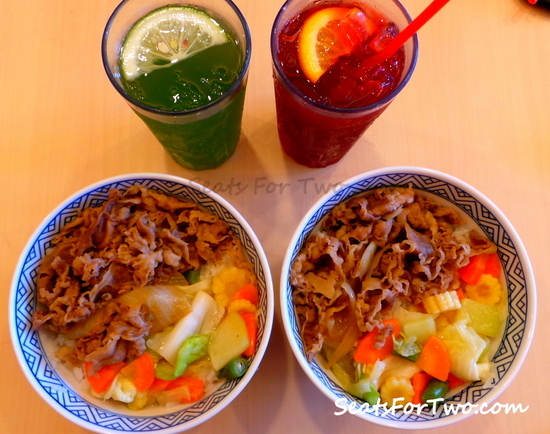 Beef Gyudon with veggie, Red & Green Iced Tea! 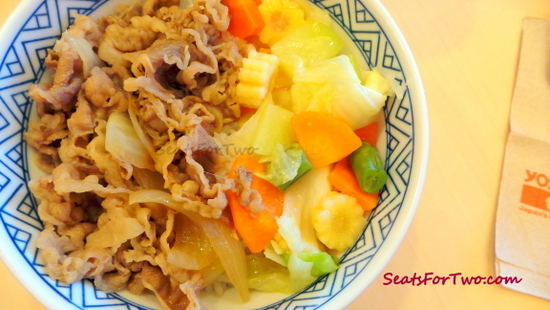 Yoshinoya’s delicious beef gyudon never change even with the innovation and upgrades made on every branches. Congratulations Yoshinoya! You may visit one of their six branches Robinsons Galleria, SM Mall of Asia, SM North EDSA, SM Manila and Glorietta 1. Started this October, you may also call Yoshinoya’s hotline delivery number, 288-288! 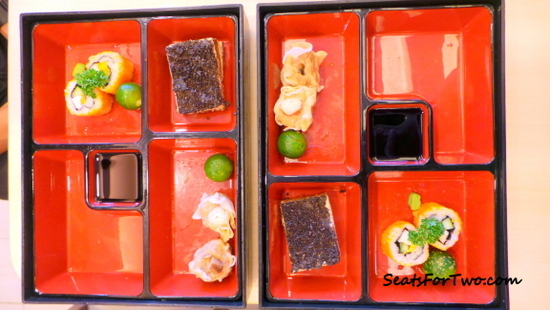 Marjorie Uy is the wifey in the SeatForTwo.com tandem. She is passionate about food, recipes, cook books and dessert is her favorite part of the meal! She's a coffee person. She loves to cook and has collected recipe books for more than 15 years now; the latest is entitled "Everything Peanut Butter" Jonel gave her on their wedding day. She used to work as a Civilian Nurse in a military hospital and as NCLEX Coach for a U.S based company. Today, she's a full-time housewife and blogging become her hobby.